On Wednesday, April 30, 2014, Hofstra Law alumna Evelyn Kalenscher ’89 received a New York State Bar Association 2014 President’s Pro Bono Service Award at a Law Day luncheon at the State Bar Center in Albany. She was the honoree for the 10th Judicial District. Kalenscher, who retired from her partnership in the firm Genoa, Kalenscher & Noto, P.C. in 1995, volunteers two days a week with the Nassau/Suffolk Law Services Volunteer Lawyers Project in its Landlord/Tenant Attorney of the Day program. She represents indigent tenants facing eviction. Since 2009, Kalenscher has handled 494 cases and contributed more than 1,100 hours of pro bono. Recently, she succeeded in having an eviction matter dismissed where the estranged boyfriend petitioner sought to evict his live-in girlfriend and their two children from the residence they had shared with him for the past 10 years on grounds that they were mere licensees. In dismissing the eviction case, the judge found that the petitioner should not be permitted to “break up the family unit and evict another family member from the family home in a summary fashion with a mere 10-day notice to quit.” Supreme Court and Family Court were the appropriate forums to settle these types of family issues. 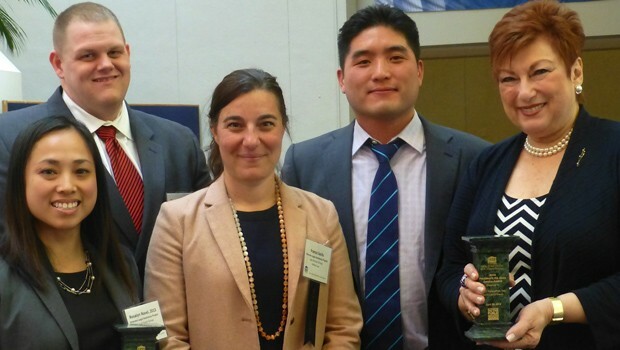 Hofstra Law’s student-run Veterans Legal Assistance Project (VLAP) was recognized with a President’s Pro Bono Service Award in the Law School Group category. VLAP received the award for organizing free legal clinics for veterans. To date, VLAP has served more than 150 veterans. Read the full New York State Bar Association announcement.